On November 16, 2012, three Filipino “guestworkers” were killed in an explosion while working for Black Elk Energy Company in Louisiana waters. These workers were lured to Louisiana with the offer of employer-provided housing and high wages, but arrived to live and work in despicable and dangerous conditions at sub-minimum wages. 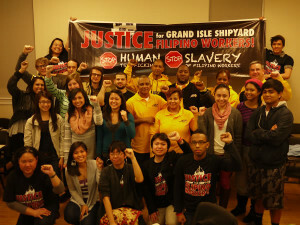 A group of these Filipino workers have filed a class-action lawsuit and engaged in a campaign to end these labor abuses. On February 20th, a delegation from New York will travel to Louisiana on a fact-finding mission to ensure that the truth behind the deaths at GIS is made public. Guestworkers face particularly challenging labor conditions, as their visa is tied to continued employment with an individual employer, creating a huge imbalance of power. However, exploitation is not unique to their particular industry or even to guestworker programs. Similar to other US workers, whether citizens, legal residents, or undocumented, these workers have been denied the most basic labor rights due to the greed of a company that put profits over people. SWA supports the organization of all workers and their right to bargain collectively in order to address workplace grievances. 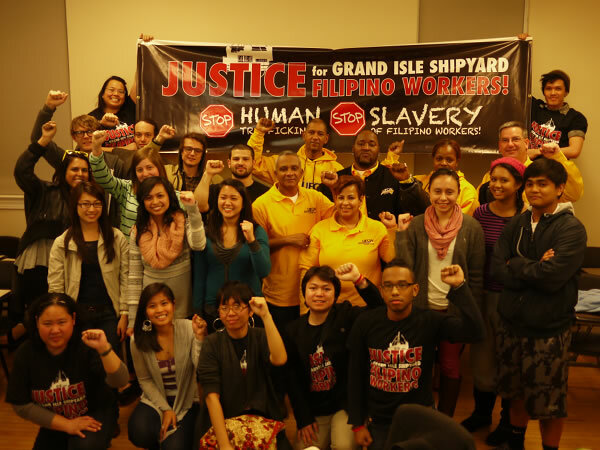 Today, the Southern Workers Assembly (SWA), a coalition of Southern labor organizations has officially endorsed the “Justice for Grand Isle Shipyard Filipino Workers” campaign, the fact-finding mission, and pledges to use the SWA network to build support for these workers in their pursuit of justice. As Southern worker organizations, we fully understand the racism and workplace exploitation that plagues this region and through experience, we have learned that these employers must be confronted by broad coalitions taking direction from the rank-and-file. Collective Bargaining is a Right!